This simple stir-fry is perfect for two, and can easily be doubled to serve four people. It's very adaptable. 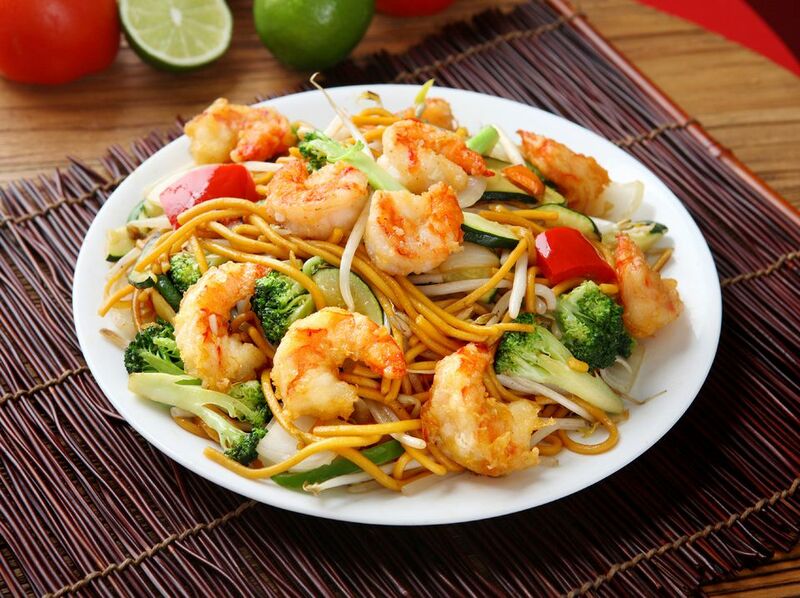 The shrimp can be stir-fried instead of boiling, or you can use leftover cooked shrimp. For a nicer appearance, trim the ends of the mung bean sprouts before stir-frying. In a large saucepan, bring 2 quarts (8 cups) of lightly salted water to a boil. Add the noodles. Cook, stirring gently to separate, for about 5 minutes, until the noodles are tender but still have a bit of chewiness (what the Italians call "al dente"). Drain the noodles in a colander. Rinse with cold water and toss with sesame oil. Rinse the shrimp in cold water and pat dry with paper towels. Remove the tails from the shrimp if needed. In a medium saucepan, bring enough water to cover the shrimp to a boil. Cook the shrimp in the boiling water for 2 minutes. Drain thoroughly. Rinse the mung bean sprouts and green onion and drain thoroughly. (Note: this can be done earlier in the day, giving the vegetables more time to drain). Finely chop the green onion. Peel and mince the garlic. Combine the light soy sauce, rice wine or sherry, sugar and chile paste in a small bowl. Set aside. Give the sauce a quick re-stir and swirl it into the pan. Stir in the green onion. Stir-fry for 1 to 2 minutes to heat everything through. Serve hot.